Symphony Nova Scotia is now welcoming applications from women composers across Canada for its second commission through the groundbreaking Maria Anna Mozart Award. The winning composer will be asked to compose an original work to be performed during Symphony Nova Scotia’s 2020/21 season. To learn more about the 2019 winner, Stacey Brown, please click here. The Maria Anna Mozart Award was inspired by Jane Gordon, (BA, MA, PhD) who taught Sociology and Women’s Studies in Halifax for almost 40 years. Gordon’s research has been published in academic journals in sociology and feminist studies and as chapters in books. She is a long-time Symphony Nova Scotia attendee, and has a keen interest in the role of women in classical music. Launched in 2016, the Maria Anna Mozart Award supports the work of Canadian women composers, providing $10,000 for Symphony Nova Scotia to commission and perform a new symphonic work by a Canadian woman every three years. The Award recipient will compose an original orchestral work for performance by Symphony Nova Scotia during its 2020/21 concert season. 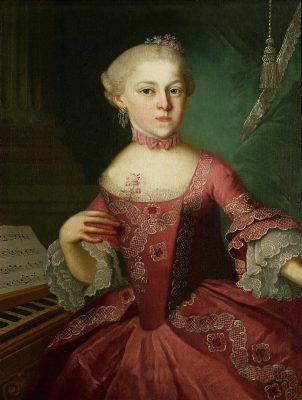 The Maria Anna Mozart Award is the only symphony-sponsored award in Canada exclusively for women composers. Applicants are asked to submit a résumé, completed application form, sample scores of up to three completed works (one scored for full symphony orchestra), and supporting audio or visual representation of at least one (preferably the symphonic) work. Composers will be judged on existing works by a committee formed by Symphony Nova Scotia. The application materials must be received by October 22, 2018, and the winner will be notified in January 2019, with a public announcement being made on March 8, 2019 (International Women’s Day). The winning composer will receive a cash award of ten thousand dollars ($10,000) to be paid upon delivery of the parts and score to Symphony Nova Scotia. The winning composer will also receive an archival recording of the performance and assistance in promoting the work to other orchestras. The Award will be granted to the successful applicant for a composition of approximately 10 minutes for the core orchestra (*2*2*22 2200 timp str (8.6.4.4.2)) with the option of up to three (3) additional parts at the discretion of the composer. The work composed by the winning composer will be performed by Symphony Nova Scotia in the fall of the 2020/21 season. The composer will be required to be in Halifax for all rehearsals and performances, and will agree to participate in education activities, pre-concert lectures, symposiums, etc., as requested by Symphony Nova Scotia. The composer’s travel and accommodation expenses will be paid by Symphony Nova Scotia. The winning composer will be responsible for professionally copying the work to specifications provided by Symphony Nova Scotia. a Canadian citizen or a permanent resident, as defined by Citizenship and Immigration Canada. You do not need to be living in Canada when you apply. Please note: eligible individuals can apply for this award or be nominated by others. An application form (completed and saved in PDF format). Sample original scores of up to three completed works (of at least five minutes in duration, one scored for full symphony orchestra), and supporting audio/visual representation of at least one (preferably the symphonic) work. Please note: scores must be PDF files, audio must be MP3 or midi files. Printed scores, physical recordings (i.e. CDs or DVDs), and internet links are not acceptable. A cover letter or letter of interest that includes potential creative vision(s) for your composition if you are the winner. Please refer to the application checklist before submitting your application. Please read the instructions carefully. If at that time you have questions about the award or the application process, please email sns1@symphonyns.ca.